Japanese are great when it comes to 'something really amazing'. 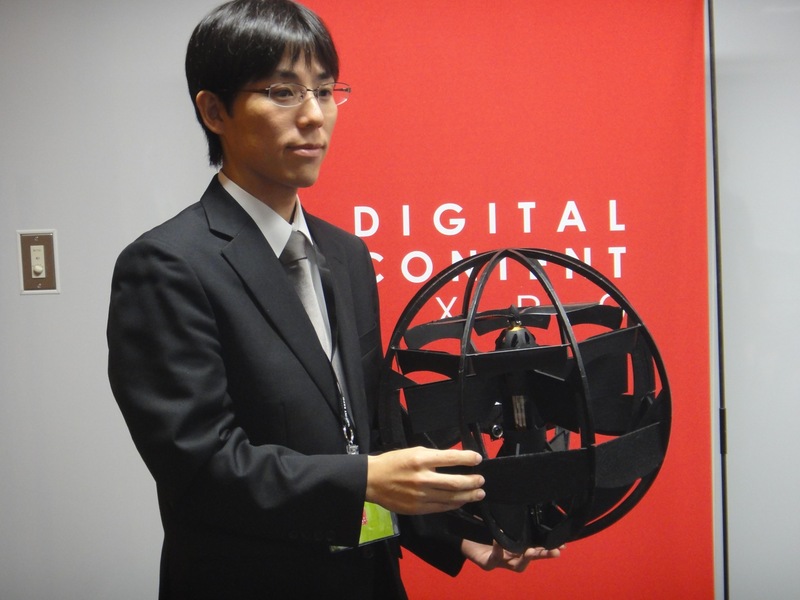 The Research Department at Japan's Ministry of Defense has developed the World's first spherical flying machine that can fly in all directions and can land in all kind of attitudes. This spherical flying machine weighs 350 g, 42 cm in diameter and is made of commercially available parts costing a total of around $1,400, according DigiInfo.tv. "Because the exterior is round, this machine can land in all kinds of attitudes, and move along the ground. It can also keep in contact with a wall while flying. Because it's round, it can just roll along the ground, but to move it in the desired direction, we've brought the control surfaces, which are at the rear in an ordinary airplane, to the front." "In horizontal flight, the propeller provides the propulsive force, while the wings provide lift. For the machine to take off or land in that state, it faces upward. When it does so, the propeller provides buoyancy. At that time, too, the control surfaces provide attitude control. After landing, the machine moves along the ground using the control surfaces and propeller." "In our aircraft R&D, we have a plane that can stand up vertically after flying horizontally. But the problem with that plane is, take-off and landing are very difficult. As one idea to solve that problem, we thought of making the exterior round, or changing the method of attitude control. That's how we came up with this machine, to test the idea." "All we've done is build this from commercially available parts, and test whether it can fly in its round form. So its performance as such has absolutely no significance. But we think it can hover for eight minutes continuously, and its speed can go from zero, when it's hovering, to 60 km/h." 0 Respones to "Japanese Engineers Developed Spherical Flying Machine"